All about web, programming and passion. All users will not be using the applications in same resolution and with same window width and height. Users still want the application’s look and feel to be pleasant. For example, a user may not want to see a horizontal scrollbar in a page even though there is enough space available vertically. WrapPanel is a control which can be used to wrap the elements inside it whenever the width of the elements exceeds the panel width. Just drag the WrapPanel from toolbox and drop it on to your screen. You can see in the above XAML code, we have a wrap panel and few TextBlock & Button Controls. Now, the advantage of using WrapPanel is when we re-size the window, we can see that, based on the window width, the controls wraps to next lines. You can see it live in below sample video how the content gets wrapped when we re-size the window width. The behavior will be same in any browser when viewing the actual output and doing resizing. As you can see, wrap panel is similar to a StackPanel virtually. Also, wrapping will not only happen if you resize your window width. It works even if you re-size the height. You can see a scroll bar when you re-size if the height or width of elements exceeds. set the properties like how do you want to position them on the screen when the screen width and height gets modified. Here comes an example of using it. You can drag and drop the control on canvas and add controls within them or you can write the XAML code yourself like below. You can see that we have provided the DockPanel.Dock property for each of the control to tell where it should be docked. It’s pretty simple and easy. Doesn’t take much code, isn’t it? OK, that’s all for now. Now, you should be able to use all available panels in Silverlight effectively. Also, please download VS 2010 project here. I have implemented all the panels. Feel free to modify and play with it. I received five emails last month especially from students on making their websites social. This post is for them and all others who are interested in social media programming. Facebook Graph API no doubt is a silver bullet and a primary way today that allows us to post and retrieve data from-to Facebook. I am using it since its inception. I must say it is amazing and easy to work with. This post is all about an interesting Facebook dialog which is powerful and has potential to generate decent traffic for your webpages. If you are a webmaster or an app developer, this post is for you. In this post, i have listed the new Features in .Net framework 4.5. All the credits for collecting the features goes to Jouni Hekikneimi, Sami Poimala and Jani Jarvinen of Heikniemi Hardcoded blog. 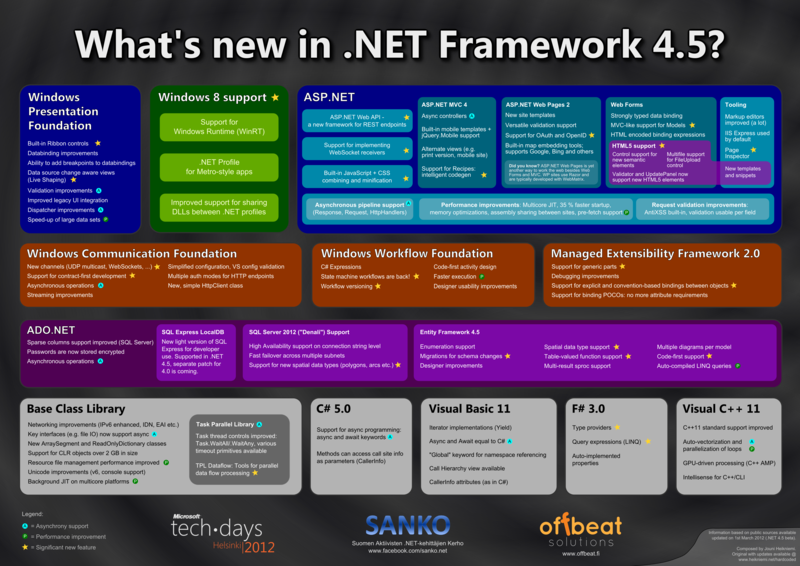 So, here are the .Net 4.5 framework features!! In this post, let us build a small proof of concept for SignalR with two basic screens. Users.aspx: A sample user home page.Admin.aspx: This page is for administrator for sending notifications to all Users. What are we doing? Admin can make announcements. Can just post a title, a message and send it simultaneously to all the users who have opened up Users screen at that point of time. Not a big deal? But, we are going to do that without making the Users screen to refresh to get notifications in any way. No timer is used. Users should see the notification via a live connection .Works like a call over a telephone! I'm Anil, a web engineer from India. I like building web applications and products for the enterprise and cloud.